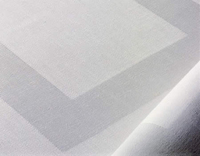 The Greenhorn Line of Linens is our Specialty Collection of Irish Kitchen, Bath and Table Linens. 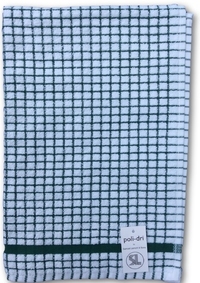 The POLI-DRI Kitchen Towels are the Original, 100% Cotton High Absorbent Long Lasting Towels that have been offered for years. 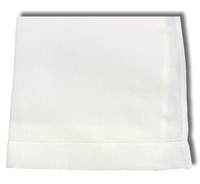 Pair the Kitchen Towels with the Linen Dish cloths for a more Natural kitchen. 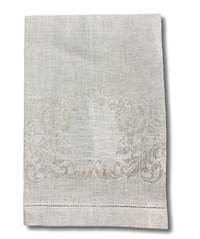 The Irish Linen Table Top is Available in Single and Double Damask. Double Damask is 202 Threads per Inch and this Heavier Weight makes for a Long Lasting Beautiful Table Linen that will Drape Beautifully on the Table and show the Pattern off Dramatically in the way it Catches the Light, Finished with a flat hem. The Single Damask is a more affordable version of the Damask Table Top Collection. 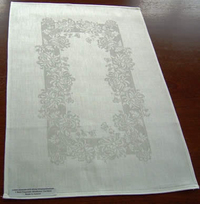 Single Damask has 165 Thread per Inch and is finished with a Hemstich Edge. Both Single and Double are available in Custom sizes and Shapes, just give us a call. 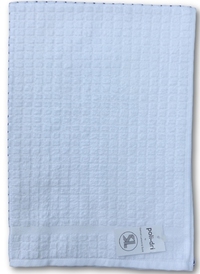 The Linen Huck Guest Towels are Perfect for Embroidery or use as plain and the Linen Terry Friction Bath Towels are Perfect for the Spa. 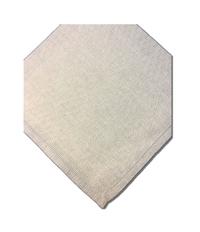 Dry your fine Crystal and Glass Ware with the Lint Free Linen Crystal and Tea Towels. 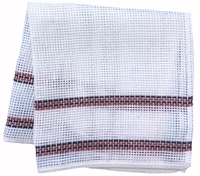 Available in Natural linen with Red or Blue stripe. Enjoy Looking through this Timeless Collection. 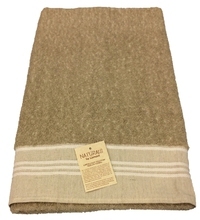 Huck Linen is an abreviation for Huck A Back which is a style of weaving linen over 800 years old. 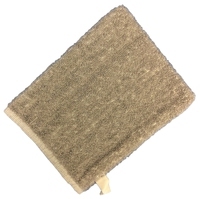 The flax is specifically woven with an uneven height to aid water absorption and to dry more quickly. 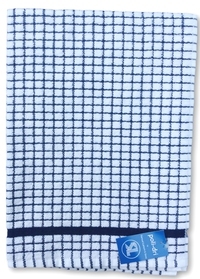 Our Traditional Huck Guest Towels, made in Ireland carry this tradition forward today. 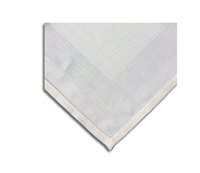 Available in Regular and Large size and with or without a Damask Crest Pattern Woven in the Towel. Made in Ireland, 15" x 22" or 18" x 32" Linen White. Finished with a Hemstitch on both ends. 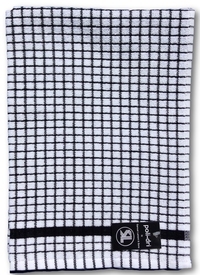 The Original Lamont Poli Dri Kitchen Towel is known as the "Best Kitchen Towel Ever" it is 100% Cotton Measures 20" x 28" approx. White with White Checks, Sold in pairs. Made in Portugal. 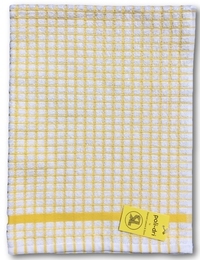 The Original Lamont Poli Dri Kitchen Towel is known as the "Best Kitchen Towel Ever" it is 100% Cotton Measures 20" x 28" approx. White with Blue Checks, Sold in pairs. Made in Portugal. 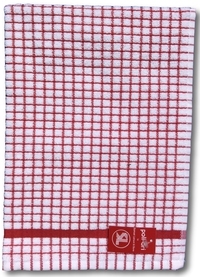 The Original Lamont Poli Dri Kitchen Towel is known as the "Best Kitchen Towel Ever" it is 100% Cotton Measures 20" x 28" approx. 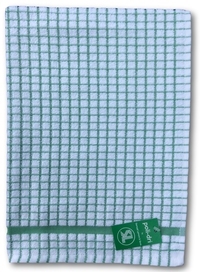 White with Light Green Checks, Sold in pairs. Made in Portugal. 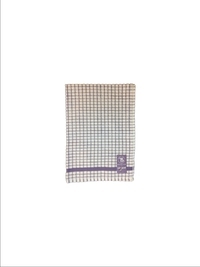 The Original Lamont Poli Dri Kitchen Towel is known as the "Best Kitchen Towel Ever" it is 100% Cotton Measures 20" x 28" approx. 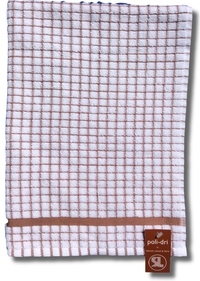 White with Brown Checks, Sold in pairs. Made in Portugal. Double Damask in the Classic Chrysanthemum is a pattern that has been Appreciated for Generations. Is Finished in a Flat Hem and is also Available in Single Damask with a Hemstitched hem. Available in Napkins, Placemats, and Table Cloths. Custom Size and Shape Table Cloths Available by Special Order, Please Call. The Simple Satin Band is Understated Elegance. 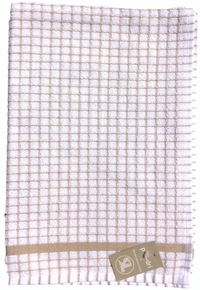 This is the Traditional Irish Linen Double Damask Weave that your Grandmother enjoyed. Finished with a Flat Hem and is also Available in Single Damask with a Hemstitched hem. Available in Napkins, Placemats, and Table Cloths. Custom Size and Shape Table Cloths Available by Special Order, Please Call.